Qatar-based investment firm Delta Two has tabled an offer for the Sainsbury's supermarket chain, BBC business editor Robert Peston has learnt. The cash offer price is 600p - not the widely touted 610p - which puts a value on the whole business of £10.3bn ($20.6bn), according to Mr Peston. The written, conditional takeover offer is also believed to be less detailed and comprehensive than a previous bid. Otherwise, it is similar to the one from a CVC-led private equity quartet. The Qatar Investment Authority - Delta Two's backer - is putting up just £3.1bn in hard equity, with the rest of the deal financed with borrowed money. This makes it similar in structure to the CVC-led bid, which Sainsbury's rejected in the spring. However, Mr Peston says Delta Two has organised debt facilities of £9.7bn, which seems to be rather more than the current bid requires, and may suggest that the 600p price is just an opening shot, according to Mr Peston. "We believe the takeout price could be significantly higher," said analysis firm Numis. "Sainsbury is an attractive investment opportunity, and we are today raising our target price to 700p." A raised bid might be required to win over the Sainsbury family, which controls about 18% of the firm's shares, and is said to be lukewarm about the proposal. Speculation about Sainsbury's future has been swirling since a number of investors called on the company to be split up. 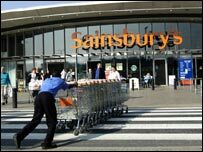 Amongst the most vocal has been property tycoon Robert Tchenguiz, who owns a 5% stake in the company and wants Sainsbury's to separate its retail operations and real estate holdings. That would allow the company sell off property holdings, returning cash to shareholders, analysts said. However, Sainsbury's bosses have said that the firm's property holdings were key to its future. Reuters quoted an unidentified source close to the talks as saying that the approach by Delta Two was "friendly and supportive" and not connected with Mr Tchenguiz. Delta Two is run by Paul Taylor, a former employee of Mr Tchenguiz. In a statement, Mr Taylor said that the Qatari investment company was interested in "strategic, long-term investments in exceptional businesses, principally in the UK". The fund wanted to focus on companies that have "strong incumbent management teams, leading market positions and long-term growth opportunities", he said.